Ivory Coast international Yaya Toure has acquired for himself an exquisite Rolls Royce, thus adding to his burgeoning car collection. 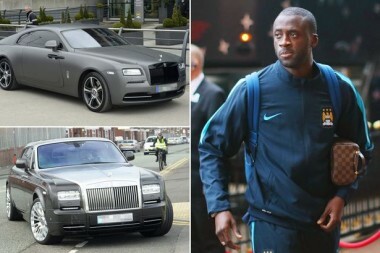 Toure, who earns a cool £230,000-a-week at the Etihad, has rocked up to training in two different Rolls Royces. The 32-year-old star's limited edition Wraith was overshadowed when Frenchman Samir Nasri arrived in a £330,000 Lamborghini Aventador. But Toure, who has spent an estimated £1m on cars, splashed the cash on a Rolls Royce Phantom, worth over £300,000.